This shop in Portland looks like a plant lovers dream! I really want to visit Portland one day, there seems to be an abundance of great creative places to visit. In the meantime I will just enjoy Pistils lovely blog instead! Visit their website. I love this little shop in Clerkenwell, it feeds my stationery obsession to the max! The last time I visited, I was in there for ages as I'd keep spotting something else interesting! There's a real mix, from modern, stylish designs to vintage ephemera. Visit their website. Another shop I could spend hours in even though it is relatively compact. 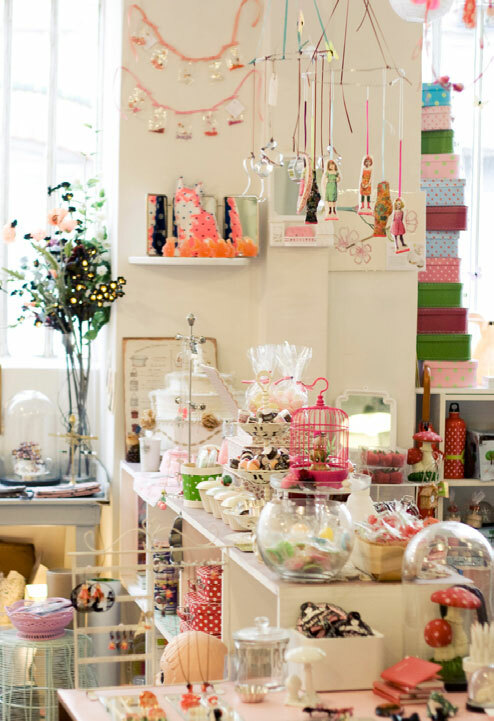 This Brighton-based store is beautifully styled and has some great display ideas. I love the shelving with the wood cladding behind it, and how they've used copper piping for the legs on that table. This shop is a must next time you are down on the coast. Visit their website. I really wanted Purl Soho in the book, but sadly it didn't work out. Seek it out next time you're in the Big Apple, or check out the 'CREATE' section of their website which features lots of really great crafting tutorials. There are lots of things on there I keep meaning to make! Visit their website. I managed to pop into this lovely shop the last time I went to Oxford. Objects of Use is full of practical but beautifully designed homewares and utensils. I love the super long wall shelf and how they've painted the wall. Visit their website. I've never been to Porto, so that's what so great about hearing all your recommendations about shops in your own towns and cities! This little shop looks super cute and colourful, full of lots of lovely things for little ones. Visit their Facebook page. Another recommendation coming in from a southern corner of the UK is Uneeko, who sell furniture and homewares with a focus on fairtrade. They have used lots of salvaged materials within the store for display purposes which looks really great - I particularly love this pallet turned shelving unit. Visit their website. I wish I'd had more time to explore Munich when I was there recently, then maybe I would have come across Welt White. Meaning White World, it is beautiful and bright and full of lovely homewares and gifts, including some by British designers such as Alphabet Bags and Karin Akesson. Visit their Facebook page. I visited this shop once ages ago, and still think about it! (yeah I know, that's how much I love shopping!!) I must make the trip back one of these days, as there is so much lovely stuff to peruse and the shop itself is very cool, yet not pretentious. I actually just got a bit carried away browsing their online shop just now, which is well stocked and also has details of creative workshops and hen parties that they host. A must to check out. Visit their website. This shop is definitely on my 'to visit' list next time I'm in Paris. In fact there are two shops, one selling gifts, jewellery and accessories and one selling homewares and flea market finds. I love how different the two stores look in these pics, both look right up my street too. Visit their website. RE was another shop which I'd loved to have included in the book, but it didn't happen sadly. I've never had the chance to get up to the northern part of the UK where their retail space is based, but I've loved their website for years. Perhaps a little staycation is in order! Visit their website. Last but not least, is this super fab children's shop in Crouch End, North London. It just looks like you wouldn't be able to stop smiling inside this store! I mean any shop with a slide inside is gonna do that right?! I love all the yellow, the branches used for clothes rails and if you are going to get away with wallpaper on the ceiling, it'd be in a fun shop like this! Visit their website.